The year 2016 will go down as a benchmark year. 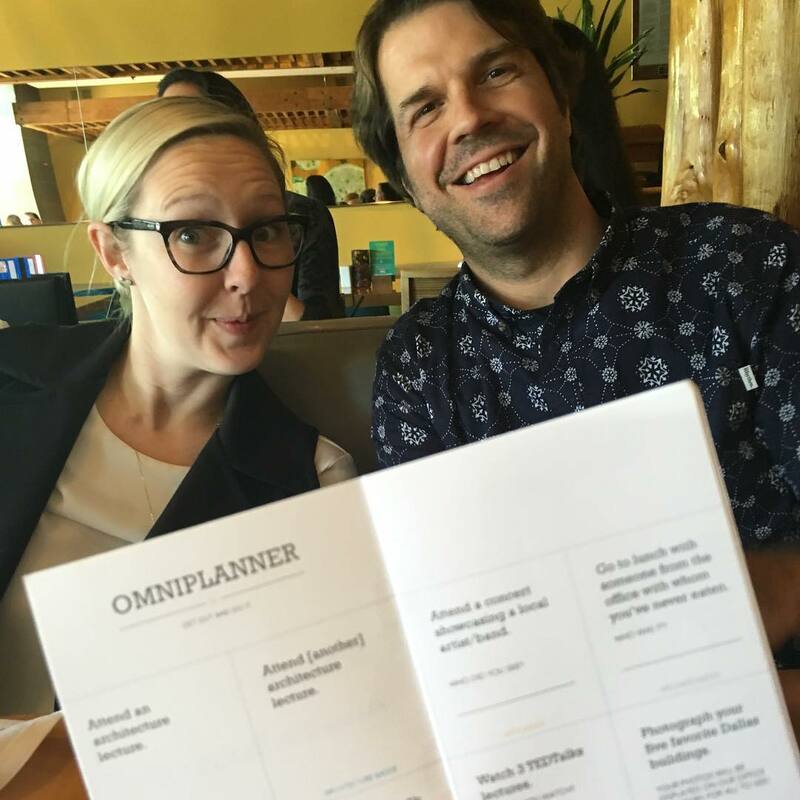 I was a newly licensed architect and by February I was offered a position at OMNIPLAN. I have been pining for an opportunity to work at OMNIPLAN since the recession hit in 2009. Upon taking this position, I soon realized that OMNIPLAN was more than just an architecture firm. A few months later, I was handed a small booklet known as the OMNIPLANNER. This booklet was to be treated as an experience passport to connect with our city in new and inspiring ways. It was filled with tasks to encourage each employee to do something bigger and more meaningful than just showing up to work. It suggested, ever so coolly, that an architect should be more than fashionable spectacles. It encouraged us to grow as individuals through tangible experiences which “inform every aspect of design and planning,” with categories of Architecture, Arts, Wellness, and Community. I’m not a native Dallas-ite, but by the end of this booklet I had fallen in love with the City of Dallas. The following are a few of my notable and favorite experiences provided by the little book. 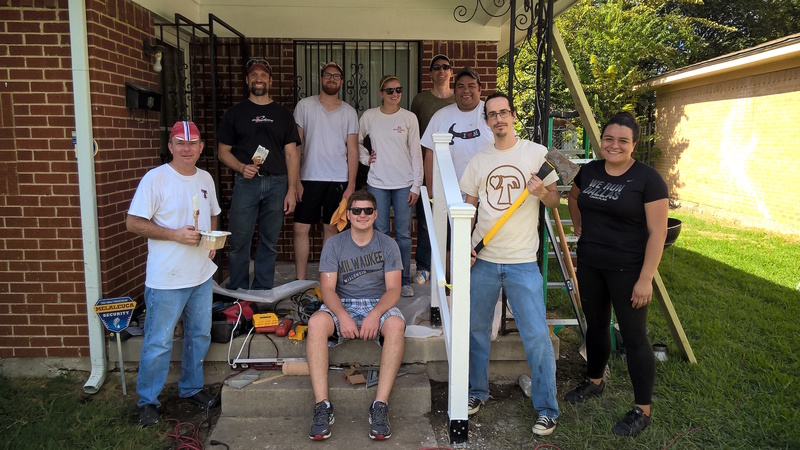 Hearts and Hammers is a non-profit organization in Dallas where residents in need can receive help with home repairs and maintenance free of charge. On a particularly stifling Saturday in September, I drove up to a modest home on a tree-lined street in the Pleasant Grove neighborhood of Dallas. My mission, along with several other OMNIPLANNERs, was to paint and provide basic repairs and maintenance to a homeowner in need. As I precariously perched myself atop a ladder to paint the last of the eave; I realized that there was something special that separates architects from any other profession. We can identify problems with buildings and solve them through design. I believe we should have a sense of responsibility to use this unique knowledge base as often and as thoughtfully as we can. Bruce Mau once said “architecture is frozen music” and it’s one of my favorite quotes about the nature of architecture. Imagine if you could freeze Gustav Mahler’s 5th symphony and walk around it, what would it look like? Would the trumpet solo appear as a monumental staircase, the horn line as clerestory lighting illuminating the ornate detailing of the ceiling? The quote captivated me so much in my first year of architecture school that I tried to imagine what piece of music each building represented when I walked through it. 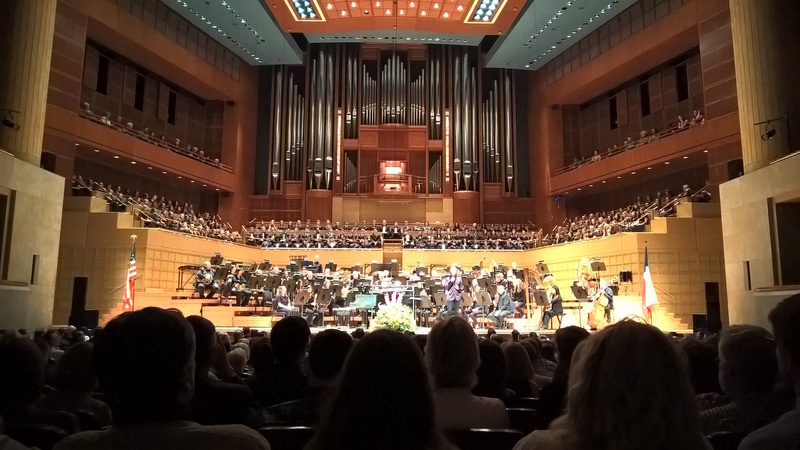 Myerson Symphony Center has always been Carmina Burana; a satirical collage of vagabond songs yet one of the most recognizable and appreciated works of music known. Similarly, the post-modern bawdiness of the Myerson belies the acoustic perfection of the concert hall. As I listened to Carl Orff’s masterpiece from the second tier, I imagined Fortuna Imperatrix Mundi as the grand concert hall itself, or more specifically the stage. It is massive, yet perfectly balanced. It is brightly lit so you cannot miss the slightest of details, and it’s the reason you came. If Dem Anger is the concourse while the skylights on the south and west sides of the building are Cour d’Amours, two lovers playing off one another in an intricate dance of light and dark. In the end, I found that Dallas has not only a superb symphony but the perfect venue in which to enjoy them. The American Institute of Architecture’s Dallas chapter is likely one of the finest in the country offering compelling lectures from thoughtful designers sourced from around the globe and continuing education courses in various pertinent subjects. In September a knowledge forum of one of my favorite topics was available, "Preservation and Renovation". This four-hour length crash course in preservation featured lectures by Norman Alston, AIA, Jeffrey Kobes, PE, Nancy McCoy, AIA, and city planner Mark Doty. I found the panel of local architects and advocates timely because Dallas has no less than 145 landmarks and over 4,000 historic properties with more being added every year. A cities’ architecture is the truest representation of where society places its values, therefore architects need to advocate for the preservation of Dallas’ landmark buildings. Historic buildings also serve as a living library of traditional construction methods and materials. 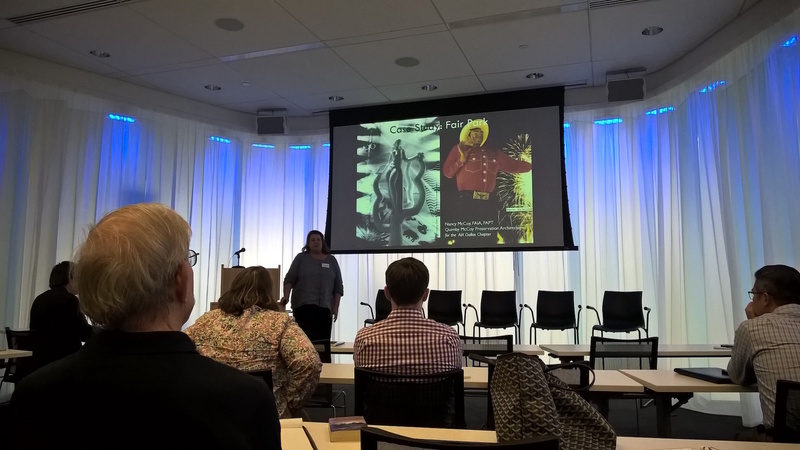 Attending this forum reignited my passion for preservation and inspired me to become more directly involved in the preservation of Dallas by volunteering with Katherine Seale, chair of the Landmark Commission. In the wake of the OMNIPLANNER, I discovered that under the concrete crust of Dallas are people who are trying to create a culture of authenticity. Instead of borrowing the latest trends from New York or Los Angeles, Dallas is using the resources available here to create unique experiences that are a reflection of the cities values. Participating in the OMNIPLANNER challenge helped me to realize these values of people, the arts, and an active interest in preserving a rich heritage while simultaneously carving channels for future enrichment. Previous Post What Do Architects Do?